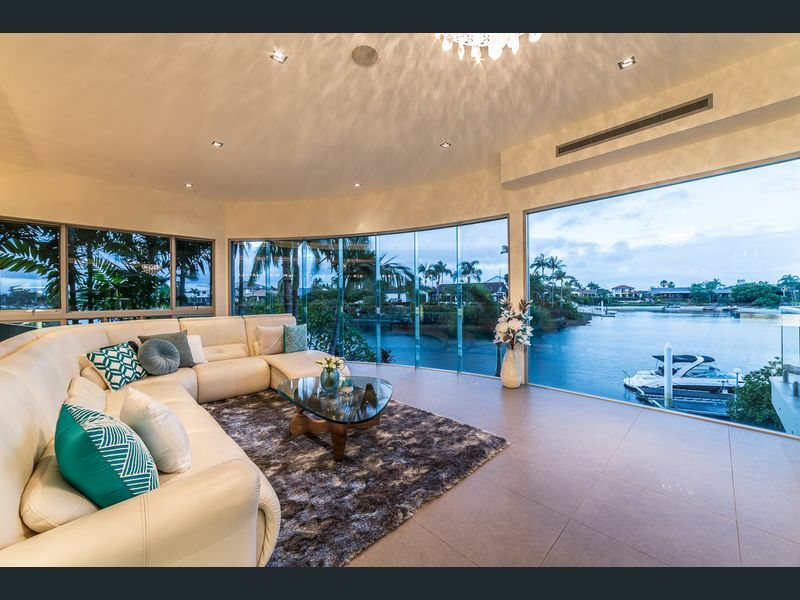 Perfectly positioned in sought-after Sorrento, this north to water, modern architectural masterpiece on a sprawling 835sqm waterfront block sets a new benchmark in luxury living in one of the Gold Coast’s most prestigious residential enclaves. Boasting an enviable point position location, striking contemporary facade, flawless finishes and fixtures throughout plus views which encompass the city skyline and hinterland, enjoy 70 squares of sophisticated living including 5 bedrooms, 4.5 bathrooms, media room, cellar and a canal-front alfresco area designed for effortless entertaining. The tone for impressive elegance is set from the moment you step through the gatehouse entry and are greeted with broad illuminated steps and glass bridge, a cascading water feature and lush, landscaped gardens, leading to the front entrance. An oversized pivot glass front door opens to reveal a soaring atrium foyer with a spectacular 23ft void, statement curved staircase and a unique illuminated limestone feature wall, while water views draw you towards vast, light-filled formal and informal living and dining areas. Showcased by a floor-to-ceiling curved glass wall, perfectly framing the water and skyline views, the lounge room links with the outdoors via bifold doors also sits nestled near the gourmet kitchen. Complete with acclaimed Miele appliances, including a 900mm gas stovetop and built-in coffee machine, enjoy the luxury backlit White Onyx, quartz stone and driftwood veneer accents of this fashionable and functional space. You’ll also enjoy hosting guests in your elegant formal dining area with dropped ceiling or retreating to the substantial alfresco entertainment terrace with outdoor bar and kitchen, TV and gas fireplace, all of which overlooks the pool and heated spa, canal and city skyline. Afterwards, why not retreat to the soundproof cinema, with drop down projector, large screen, kitchenette and wine cellar. The essence of sophistication continues with the bedrooms. 5 in total, the delightfully decadent master suite presents with picturesque water, skyline and hinterland vistas, a waterfront terrace, walk through wardrobe with premium cabinetry plus a divine spa ensuite. Bedrooms 2 and 3 share a two-way bathroom, each with walk-in-robes, with bedroom 4 boasting its own ensuite and a built-in robe. Downstairs, the 5th bedroom awaits, with an ensuite, along with an executive study, featuring exquisite custom cabinetry and a quartz desk. Other superior features of this property include a living room with bespoke backlit entertainment unit, video intercom, CCTV security cameras, multi-room distributed audio system and connectivity, vacumaid, ducted air-conditioning, double garage and a pontoon with jet ski roller system and able to accommodate a large watercraft. Situated in a tranquil cul-de-sac and an exclusive neighbourhood, you are also less than 10 minutes drive from the golden sands of Surfers Paradise or Broadbeach and approx. 6km from elite school TSS and approx. 8km from St.Hilda’s.